Two first responders with Knox County Rural Metro in Tennessee recently learned that it's not just their knowledge of medical issues and trauma treatment that help their community – it's also their compassion. Justin Pratt, a senior pastor at Clear Springs Baptist Church in Corryton, Tenn., had just grabbed a bite to eat after church on Sunday when he noticed a van speeding out of a shopping center's parking lot. Left behind was a woman clearly in distress, sitting on a curb and sobbing. Initially, he thought to let her be, but it had nagged at him. "Something in my spirit told me to go back," Pratt wrote in a Facebook post. "She shared that she had been verbally abused and kicked out of her home. I asked her if we could call the police or anything and she begged me not to." That's when Pratt noticed two first responders at the nearby Rural Metro Fire Station No. 34. He was concerned for her health, he told Knoxville news station WBIR, and asked if Firefighter/EMTs Blake Sexton and Grant Hickman, who had just returned from a busy call day, if they could make sure she was okay. The woman said she did not need to go to the hospital, but the men didn't want to just leave her. "Is there anything we can do for you before we leave, and she said 'I just need some prayer,'" Hickman told the outlet. "What happened next stirred me and lit my fire. 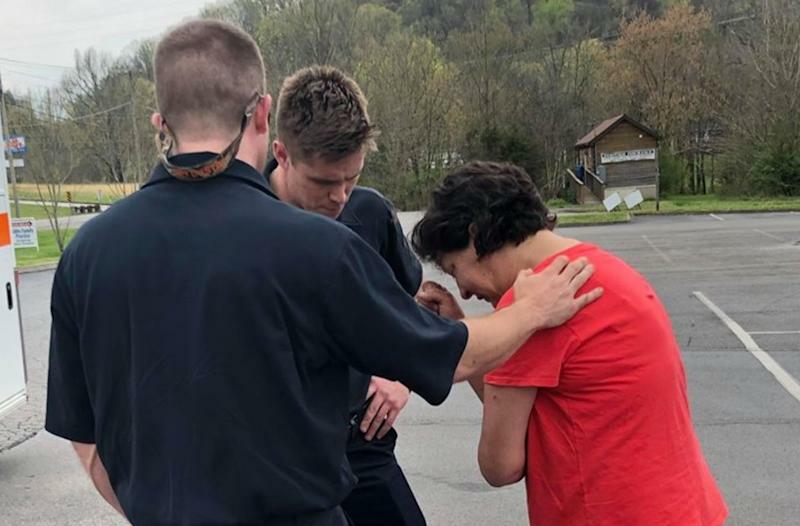 These [two firefighters] instantly, at that very moment, in the middle of a crowded parking lot followed her requests and prayed for her on the spot... just stopped and done it immediately," Pratt shared. "I led us in a word of prayer, and from her emotional expressions... you could tell that doing that for her was more than anything medically we could have given her," Hickman told the outlet. "You could tell that doing that for her was more than anything medically we could have given her." Pratt said that the woman was hoping to stay with her brother until she could get back on her feet. The woman, he said, believes God put those first responders there for her. To Pratt, the men's response was "compassion at its finest."